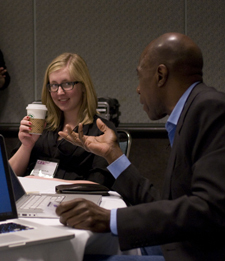 For the 2015 Annual Conference in New York, the Student and Emerging Professionals Committee seeks established professionals to volunteer as practice interviewers for the Mock Interview Sessions. Participating as an interviewer is an excellent way to serve the field and to assist with the professional development of the next generation of artists and scholars. In these sessions, interviewers pose as a prospective employer, speaking with individuals in a scenario similar to the Interview Hall at the conference. Each session is composed of approximately 10–15 minutes of interview questions and a quick review of the application packet, followed by 5–10 minutes of candid feedback. Whenever possible, the committee matches interviewers and interviewees based on medium or discipline. Interested candidates must be current CAA members and prepared to give six successive twenty-minute interviews with feedback in a two-hour period on one or both of these days: Thursday, February 12, 11:00 AM–1:00 PM and 3:00–5:00 PM; and Friday, February 13, 9:00–11:00 AM and 1:00–3:00 PM. Conference registration, while encouraged, is not required to be a mock interviewer. Desired for the sessions are art historians, art educators, designers, museum-studies professionals, critics, curators, and studio artists with tenure and/or experience on a search committee. You may volunteer for one, two, three, or all four Mock Interview Sessions. Please send your name, affiliation, position, contact information, and the days and times that you are available to Megan Koza Young, chair of the Student and Emerging Professionals Committee. Deadline: January 31, 2015. The Mock Interview Sessions are not intended as a screening process by institutions seeking new hires.